Shows the adventures of two (endangered) Richmond Birdwing Butterflies as they seek a new home and new friends. 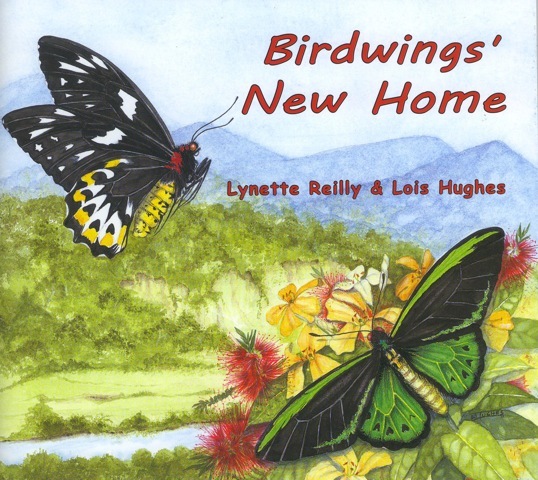 While readers relate to the problems of moving house, finding new friends and a new place to play, they absorb details of the butterflies’ life cycle – requirements and hazards – and realise what we can do to help conserve them. Ecologically correct, with exquisite full-page illustrations, this book is for everyone interested in learning more about the wonders of the natural world. What a fantastic book! I love the pictures and my kids love the story! Beautiful! thanks!!! The book sounds great – we have Micky’s Music and love it so am looking forward to a book from the same author. My daughter has planted birdwing Vines at her primary school in a riparian rainforest revegetation project and is very interested in the butterflies preservation. What a great book! For lovers of Birdwings of all ages – and future lovers of Birdwings. So informative in such an engaging way. Am absolutely delighted with your books. Charlie and I will be planting two more pararistolochias today.